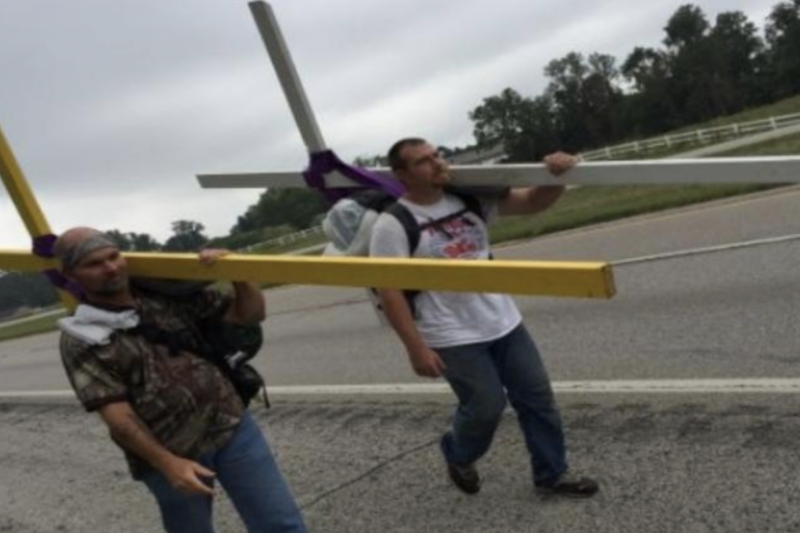 I was moved by this image from a 2015 news story of a couple of Christians walking with crosses as a public witness that all people are loved by God. The thing that moved me most was that they are each carrying their own crosses, but they are not alone. They are together. Christian faith is a communal life. It is true that each of us makes our own personal response to Jesus’ personal invitation to us, but once we have given our yes we become a part of something much greater; a body that rejoices in the growth of our sisters and brothers and which together suffers from the sin of every member. In today’s gospel Jesus’ friends Martha, Mary & Lazarus gave a dinner for him. It is clear that here is a place where Jesus is relaxed and where expressions of human friendship and intimacy are present: “Mary took a litre of costly perfumed oil made from genuine aromatic nard and anointed the feet of Jesus and dried them with her hair; the house was filled with the fragrance of the oil”. Jesus experienced human friendship. “Loneliness is an inescapable and painful fact of human experience. St. Teresa of Calcutta believed that loneliness. often accompanied by despair and hopelessness, is the virulent affliction in the West… In England loneliness is considered so serious that it has created an entire national Campaign to End Loneliness is not only afflicting adults. It is on the rise among teenagers. As noted in The Economist, “Whether it is a consequence of phones, intrusive parenting, and obsessive focus on future job prospects or something else entirely, teenagers seem lonelier than in the past.” Loneliness p.xi . Introduction Gerald A. Arbuckle. It is my experience that when I set out to find friends I fail finding the attempt frustrating and exhausting. However when I seek to live fully in relationship with Jesus Christ, friends arrive, and I have no doubt are given to me by God. I think this is why I find the image above so inspiring – these travelling companions are carrying their crosses together. Those who carry their cross immediately experience friendship with others who walk this path via Calvary to resurrection. There is something significant too in realising that while we have a call and responsibility to use our gifts and abilities fully in every aspect of our life, the achievements and successes that come from our hard work will never satisfy our loneliness. Loneliness is overcome in the moments when we transcend our individualism and remember that we are bonded together by our common need for God. Allow Jesus to reveal to you any loneliness you may be experiencing. Know that this feeling is a sign that you are a healthy human, aware that nothing on earth can satisfy you completely. If you feel a need for renewed and deeper friendship, ask Jesus for this knowing that he will provide. Remember that we humans are created to carry our crosses together, sharing the company, the burden and the desire for abundant resurrection life. A beautiful piece of writing with a wonderful message. Thank you Father. It is so true that we are not alone as Christians, not only do we have Jesus as our personal friend but we have the friendship of our Christian friends who feel the same way. We are a community who share so much in common in this secular society we live in, that seems so indifferent to our beliefs. 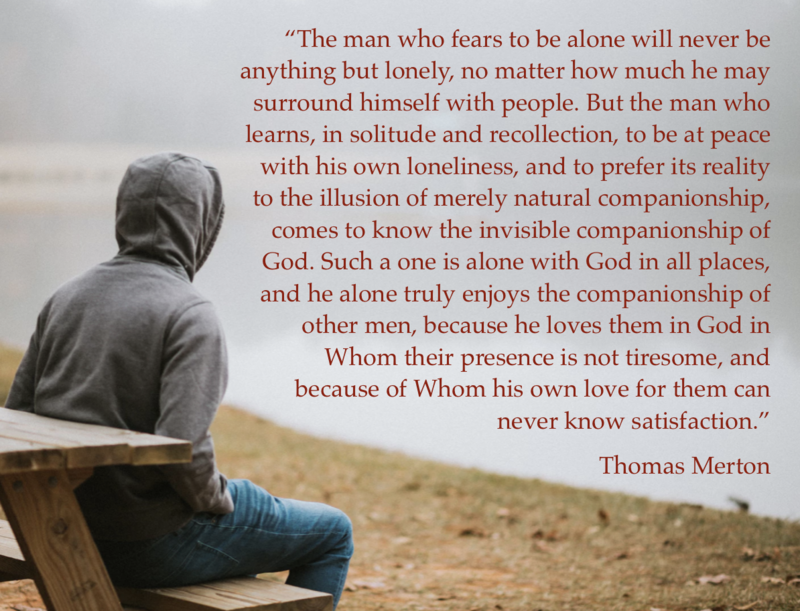 Wisdom again, thank you Father John, and I raise up all of those who feel their loneliness today, especially the isolated elderly and those who have broken relationships. That God will pour out the balm of His love to bring comfort and peace. Thank you very much for these wonderful thoughts, they fill me with warmth God Bless you. Loneliness is a human construct, a concept underpinned by those often crippled by self doubt. The basic tenet of Christian life is faith – the promise that you are never alone. The antidote to loneliness is faith. I feel a common bond with my faith friends and aquintances. We all carry a cross of some sort and it is good to be able to support one another. Even by prayers, a phone call, a visit, sharing a cup of tea or a meal, listening is a big one, giving someone your gift of time. And above all to know Jesus is always there for me is warming for me. Some years ago we had a seminar in the Archdiocese, on Belonging, as part of our Stewardship programme. We looked at the scriptural and psychological basis of belonging as well as the importance of belonging in various settings – parish, schools, working with the poor. A wonderful antidote to loneliness. How blessed we are in our Faith ! Involvement in Faith through Liturgy, Ministry, or groups opens us up to a large friendship circle in sharing Faith, the needs that are all around us, and the Service of meeting those needs, as befits our gifts and talents.